Prince of Persia Warrior Within is a truly outstanding new edition of the best selling game that has won many awards from leading games authorities. I found the game to be very good indeed and highly entertaining to say the least and I had many hours of fun negotiating the various levels. The graphics are very good also and really do make the game come to life before your eyes. Top game all round. 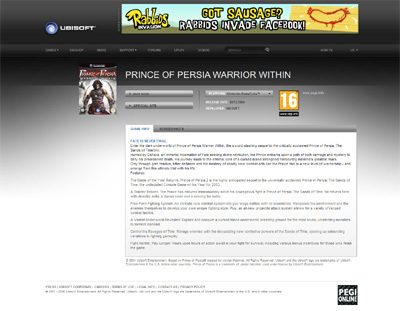 We have also compiled a Review System for this, of which Prince of Persia Warrior Within is Rated as Four Stars, the second highest possible score available from the Game Review Team.